"Treating lamb to this root beer marinade has historically been a success, so I've been eager to try it with some skewered beef. I originally used 2 tablespoons honey, which was too sweet, so I've adjusted it in the ingredients list and added vinegar as well. This recipe is easy to adapt, and I'm not just talking about the pre-grill soak, but also the glaze we make with the extra marinade. The flavor is reminiscent of bourbon beef." Mix oil, black pepper, cayenne, chipotle, ketchup, honey, soy sauce, vinegar, and root beer together in a bowl. Cut steak lengthwise down the middle and slice across the grain into 1/2-inch pieces. Add beef to the bowl of marinade and mix thoroughly. Cover with plastic wrap and marinate in the refrigerator for 4 to 12 hours. Fold beef pieces in half and thread them onto 4 or 5 skewers. Pour the marinade into a saucepan over medium heat. Cook until a thick glaze forms, 5 to 10 minutes. Cool until slightly thickened. Preheat a charcoal grill to high. Place skewers on the grate over direct heat. Grill, flipping occasionally, until beef starts to spring back to the touch, 3 to 4 minutes per side. Brush glaze on top. Garnish with sesame seeds. 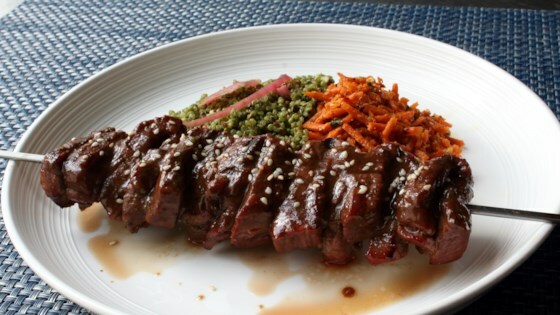 Treat flank steak to the ultimate balance of sweet, spicy, and sour. For more complex, less-sweet flavor, use good-quality root beer if possible. Cider vinegar works as well. Nutrition data for this recipe includes the full amount of marinade and glaze ingredients. The actual amount of marinade and glaze consumed will vary. Next time I would let it marinate longer to see if that brought out more of the flavor.